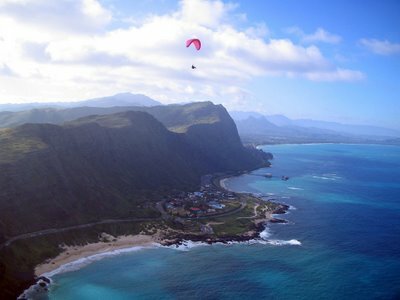 Makapuu is the premier ridge soaring site on the eastern-most point of Oahu. It has been flown continuously by hang gliders since the early 1970s. The site extends from the steep-cliffed area at the ironwood trees to the lighthouse at Makapuu Point. Rabbit Island and Black Island are just offshore. There is one primary landing zone, and four primary launches that work in a broad range of conditions. It is important to be proficient with high wind reverse launches here. If the conditions are strong trade winds (NE to ENE and greater than 10 mph), or the pilot is a low airtime pilot, then Kahana would be a better choice of flying site. From Honolulu: Take the H-1 Freeway east until it becomes Kalanianaole Highway (Route 72) and continue for 9 miles past Hawaii Kai Golf Course. As you turn along the cliff and see the islands offshore, the parking for Cactus and Manic Depression is on your right. Continue down past Sea Life Park, and on your right you will see a wind sock. Turn into the driveway -- the flat grass area is the Landing Zone. From Kailua/Windward Oahu: Turn onto Kalanianaole Highway (Route 72) east and continue approximately 7 miles east past Makai Pier. As you approach Sea Life Park you will see the windsock and Landing Zone on your left. NOTE: There is no one right place to truly gauge the winds correctly. Local pilots use a combination of sensor reports and wind sightings on the water to give an accurate reading. Many a pilot has been fooled into thinking because it was light at the landing zone then it is fine above. The landing zone for Makapuu is situated on the ocean side of Kalanianaole Highway, across from the back entrance to Sea Life Park (Waimanalo end). There is a large windsock on the dunes and a smaller one next to the driveway that marks the landing zone. The normal trade winds are from the ENE, which makes the normal landing approach originate from the pier end of the field, flying parallel to the road and touching down in the large area adjacent to the windsock. If you overshoot the landing area and avoid any parked cars, then the dunes make a fine backup landing spot. NOTE: Take caution to avoid landing in or around the road, especially on very north or windy days. If the winds are very strong and the Landing Zone is in the wind shadow of Rabbit Island, landing on the beach further towards the lighthouse might be a better choice. Please do not land in the area near the Heiau (ruins of an ancient Hawaiian temple) between the bathroom on the Waimanalo side and the parking lot on the lighthouse side. There are three primary launches we can use to get airborne at Makapuu. Cactus is best for newer or less current pilots when the wind is light enough to use it. The other two lower launches require more judgement and experience. The launch known as Tomato Juice (or Juice for short) is no longer listed or recommended due to its proximity to high voltage power lines. Cactus launch lies at 400’ MSL atop the ridge above Makapuu beach and is accessed by a 15 minute hike from the parking lot at the lookout. Cross Kalanianaole Highway, watch for the fast moving traffic and find the jeep trail up to the top. Note: Jeep trail = rock crawlers. At the flat-topped ridge above the bowl is the launch. Cactus launch works best with the wind at the LZ from the NNE to ENE at 1 to 8 mph. On launch this translates to 5 to 18 mph. When the winds are light Cactus is excellent even for the low time pilot. Unfortunately, light winds on Cactus are rare and quickly build. Top landing is possible here on good days. In strong winds, the penalty for a botched launch is a dance through a few boulders, and picking your glider from the bushes. The normal flight heads to the left after launch and works the dark cliff face to gain altitude. Ridge lift is plentiful here. Crazy Man’s is the launch directly below the road, where the road curves 80’ above the beach. The launch is a little rough since we don’t have the authorization to improve it. Needless to say, it is very convenient as you can layout 20’ from your car. Crazy Man’s is good in wind conditions from NNE to ENE at 8 to 16 mph at the LZ, which translates to 9 to 18 mph on launch. When the winds are more northerly, the lift is abundant. When it is really easterly, the lift comes and goes, so it is important to pick a strong cycle. The lift is normally found to the right of launch, but this takes you out over the ocean, so if you are not getting up, make sure you have some altitude to get back to the beach. THE BEACH: The beach is not okay to land on when the lifeguards are on duty. The lifeguards work from 9 to 5 weekdays, 8:30 to 5:30 on weekends, so it is okay before and after they are on duty. Having said that, the beach is also the safest place to land when low, and if you do land on the beach, a “beer fine” of a six pack of Heineken is due. Tell the lifeguards “thanks” and move on. The rule of thumb is: if it looks kind of light, then launch up higher. Manic Depression, 180’msl, is in the little bowl below the parking lot at the lookout. It works in lighter conditions from NNW to NE at 4 to 8 mph at the LZ, which translates to 9 to 16 on launch. The launch can be windy and is directly over the ocean. The bombout is a ways to the left, back at the beach below Crazy Man's launch. The normal lift is found to the left of launch near the road, except when it is very N, when the lift is to the right on the lighthouse side. Conditions change fast here, much in the same way as at Cactus, so be aware. In general, if it is strong (i.e., difficult) to launch, then there will be plenty of lift once in the air. The ridge is composed of three primary parts: Sea Life Park, Hang Glider Launch, and the Lighthouse. 1). Sea Life Park: This is the primary flying area in most any flyable conditions there. It encompasses the area from the venturi at the lookout parking area to the venturi above Makai Pier. All the launches are within this area. The best place to get high is at the high peak known as Three Poles. If the wind is strong and northerly, be aware of turbulence coming off Rabbit Island and possibly affecting the LZ. 2). Hang Glider Launch: This is the area from above Makai Pier and the east Hang glider launch to the cluster of Ironwood trees before the ridge turns the corner into Waimanalo Valley. The hang glider launch is in the center of this area at 1200’ MSL. This is the area to really get altitude for acro runs over the water or for the start of XC flights down the Koolau Range. 3). Lighthouse: This is the area from the lookout to the lighthouse at the point. It works best when conditions are more northerly and you fly directly over the water. When conditions are very easterly, you can push into the wind from above Sea Life Park and fly around to the east side of the lighthouse ridge, but be careful not to get stuck here - there are no good landing options. 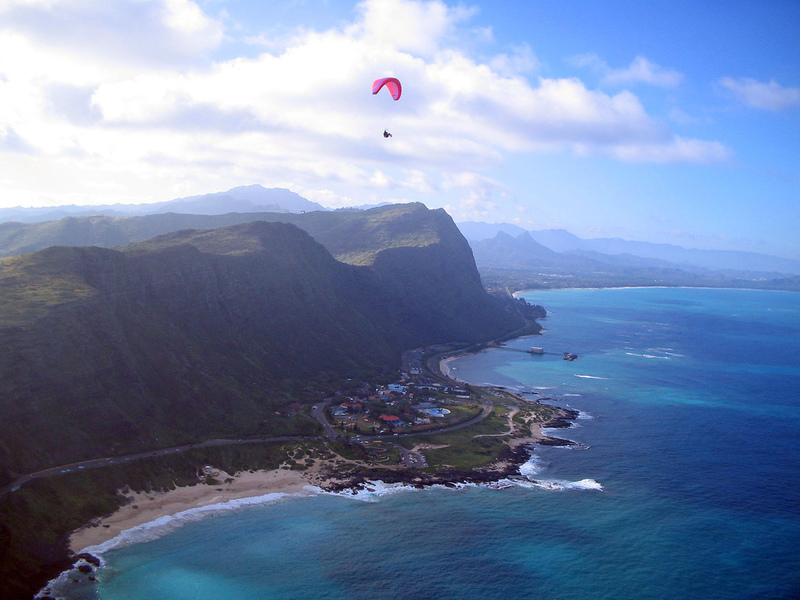 We recommend flying at Makapuu with a local pilot. Always remember to be respectful to non-pilots you encounter. Enjoy.